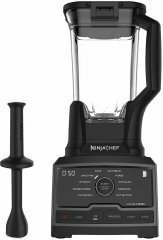 Given its compound rank of 90%, we determined that the Ninja Chef CT805 is currently Alphachooser's best Ninja blender 2019. We also believe that our 111 reviews sampled from our sources give us a high confidence level (more on confidence levels) that justifies to call it a "no-brainer best choice." 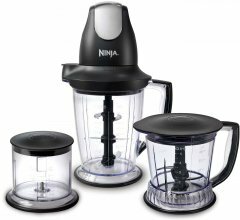 With its star rating of 4.5 averaged from 4494 reviews, we rank this Ninja model second best Ninja blender. * By the way, our list is based on an in-depth analysis of hundreds of reviews from multiple sources. A 900-watt nutrient and vitamin extractor with two blending jars that can also be used as travel cups. An interchangeable blending set that you can use for preparing food and blending frozen drinks. A stylish 1000-Watt blender with a generous 72-ounce capacity, 6-razor blades, three speed variations, and a pulse action. An ambitious 72-ounce 1500-watt versatile blender part of a series (Ultima) that pretends to replace more than a dozen appliances. This one focuses on single-serve drinks, with its three included goblets and lids. Quite-flexible 1100-watt blender with blades, cups and jar for single drinks, ice crushing, etc. Blender that only has one button (pulse) and trumpets the ability to act as four kitchen appliances. Do-it-all 2-HP blender with three sizes of BPA-free decanters and four Ninja-patented blades designed for varied kitchen tasks like juicing and dough mixing. One-speed 40-ounce 550-watt blender with a dough blade and paddle as well as travel cup jars with lid. A large-capacity 1000-watt blender with a 72-ounce dishwasher-safe jar, and a six-razor blade.